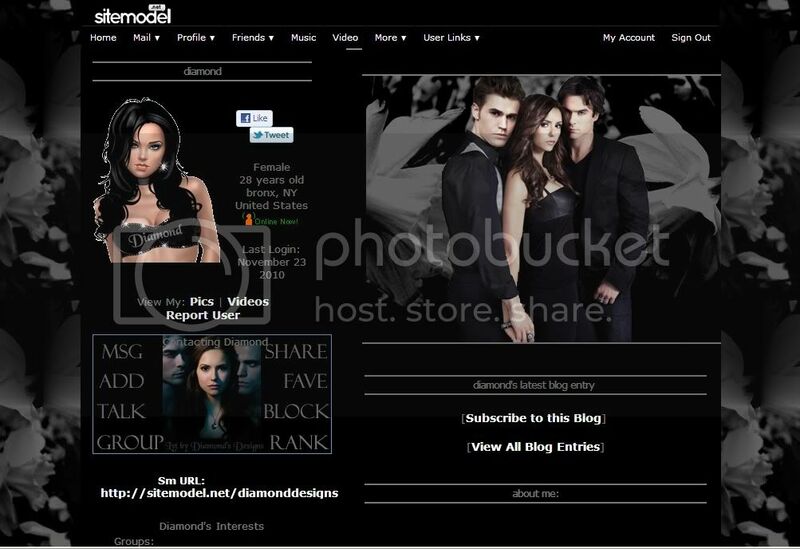 This entry was posted in Dark 1.0, Entertainment, Gothic, Roleplayer.me, TV and tagged damon, Dark 1.0, Default, elena, stefan, vampire diaries on November 23, 2010 by Diamond. 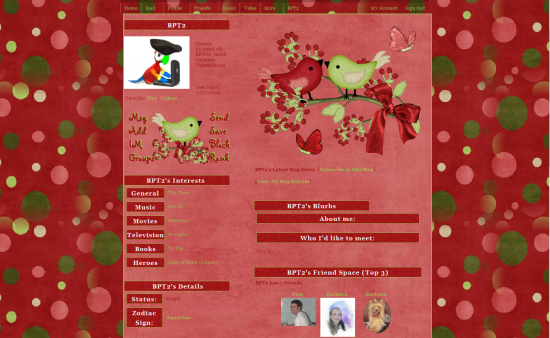 I made this layout with PDN/PSP/Animation Shop. This layout was made to be used on individual MySpace profiles. Hotprofileplus, HotLayouts2u or any affiliate does not have my permission to use or post this layout or any images used in this layout on their website and neither does any other website. This entry was posted in Holiday, Roleplayer.me, St. Patrick's Day 1.0 and tagged Cute, Default, Girly, green, skemaholic on February 20, 2010 by Barbara Mc. I made the background, contact and banner with scraps, http://www.berryblissscrapz.com/ and PDN/PSP/Animation Shop. This layout was made to be used on individual MySpace profiles. Hotprofileplus, HotLayouts2u or any affiliate does not have my permission to use or post this layout or any images used in this layout on their website and neither does any other website. This entry was posted in Animals, Roleplayer.me, Skem9/ Skemaholics 1.0, Spring 1.0 and tagged animated, Colorful, Cute, Default, Girly, Glitter, skemaholic on February 18, 2010 by Barbara Mc. Laura Mae sent me this beautiful image which is a Baby’s Creations image. 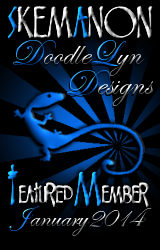 I added and glittered the text, made the background, contact and table titles with PDN/PSP/Animation Shop. This layout was made to be used on inidividual MySpace profiles. Hotprofileplus does not have my permission to use or post this layout or any images used in this layout on their website and neither does any other website. 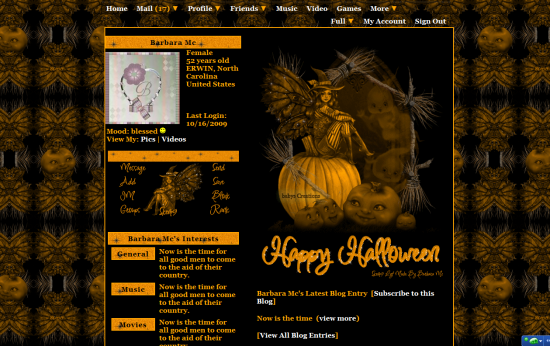 This entry was posted in Cute, Default, Fantasy, Girly, Holiday, Miscellaneous 1.0, Roleplayer.me, Skem9/ Skemaholics 1.0 and tagged animated, Default, Girly, Glitter, halloween, skemaholic on October 16, 2009 by Barbara Mc. I made and animated the en, backgrounds,table titles and contact from scrap kits with PDN/PSP/Animation Shop. Please ask before you borrow any images from this lyt. 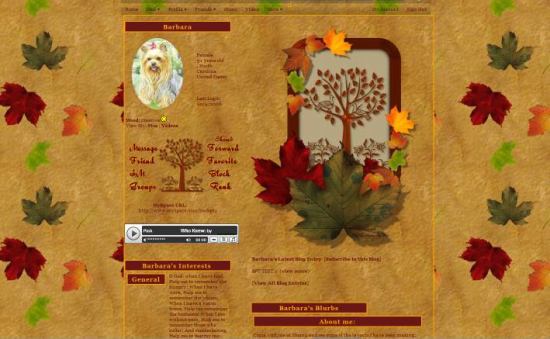 This layout was made to be used on inidividual MySpace profiles. Hotprofileplus, HotLayouts2u or any affiliate does not have my permission to use or post this layout or any images used in this layout on their website and neither does any other website. 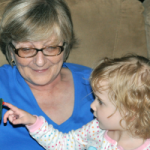 This entry was posted in Autumn 1.0, Bright/ Happy 1.0, Cute, Default, Miscellaneous 1.0, Roleplayer.me, Seasonal, Skem9/ Skemaholics 1.0, Uncategorized and tagged animated, Cute, Default, skemaholic on September 8, 2009 by Barbara Mc.